Tesla delivered the first Dual Motor Model 3 on July 28th, 2018. But the company, as you would expect them to, started registering Dual Motor VINs on June 1. Since then, Tesla has registered more than 25K Dual Motor VINs. 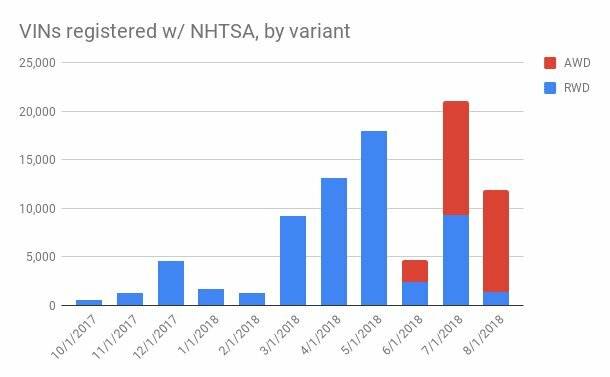 To put that in better perspective, between June 1 and August 6th, Tesla registered 35,317 VINs, and nearly 70% of all VINs registered are Dual Motor. Of-course, Tesla could have prioritized building Dual Motor version that starts at $54,000 over building the cheaper Rear Wheel Drive version. But, would they have done it if there wasn’t enough demand for it? According to the law of averages, demand should increase as price takes a southern trip. But in the case of Tesla, customers seem to prefer the more expensive All Wheel Drive over Rear Wheel Drive. Is the mid variant Model 3 more value for money? Because nearly a year ago, Insideevs predicted that this would happen: Model 3 customers prefer Dual Motor AWD . As you can see from the current VIN registration mix, that’s exactly what is happening now. Dual Motor AWD version now accounts for nearly 70% of VINs registered. If this continues, Tesla will be looking at an average selling price of over $60,000 for the third quarter. In its second quarter shareholder letter Tesla noted that the company is expecting to build 50,000 to 55,000 Model 3s during the third quarter. At an average selling price of around $60K, Tesla Model 3 should bring in a cool $3 to $3.3 billion in revenues during the quarter. The other important factor to note is, Sandy Munro, president of Michigan-based Munro & Associates, tore down the same version and concluded that this is the most profitable electric model to date with nearly 30% margins. Tesla’s best seller is the most profitable electric vehicle to date. Guess it’s time to go private then.